The MGM-5 Corporal missile system was the world's first surface-to-surface guided missile capable of carrying either a conventional or atomic warhead up to 75 miles away. First deployed in 1955, the Corporal served as a nuclear deterrent against a Soviet invasion of Western Europe. While the system was a first, it suffered reliability problems with roughly 50% of the missiles hitting their intended targets. The system was not only fielded by the US Army in Europe, Corporal also served in the British Army until replaced by the solid-fueled MGM-29 Sergeant. Of course the Soviets responded to this threat in-kind with a now famous missile - the SS-1 Scud. The first versions of this weapon could carry conventional, chemical, or atomic warheads over 100 miles. Like the Corporal, the Scud evolved from post-war testing and developments from captured German V-2 rockets. Both were liquid-fueled (and took serious preparations and handling to ready them for launch) and truck transportable. As history has shown in more recent combat experience, even the more modern variants of the Scud suffered similar accuracy problems like the Corporal. Unlike the Scud however, the Corporal was never fired in anger. 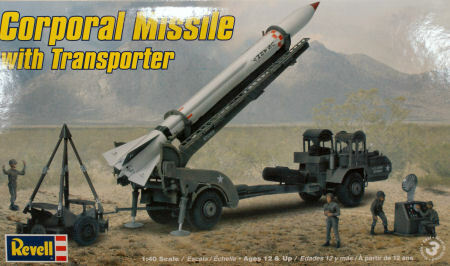 Here is an old old old old classic kit from Revell that hasn't seen the light of day in a few decades, the Corporal missile. I hate to think what original releases of this kit were valued on the collector's market, but anyone actually wanting to build one would have had to pay a premium to do so, until now. 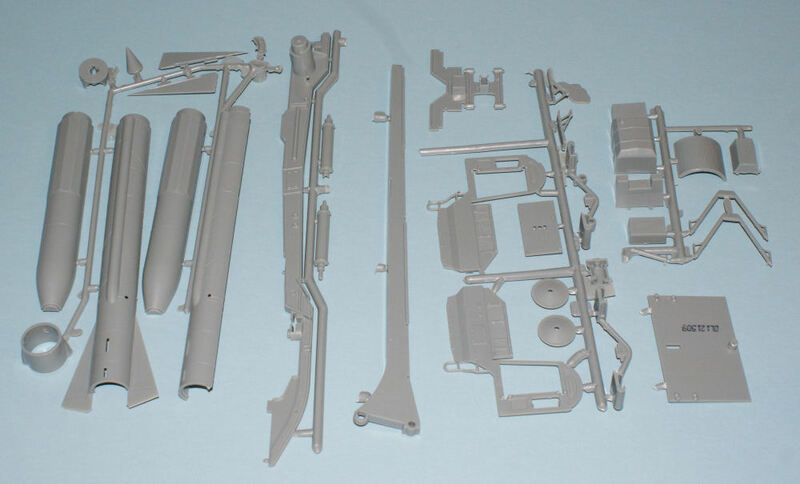 Molded in light gray styrene, the kit is molded on sprue shots that are similar in design as their wide array of car kits. 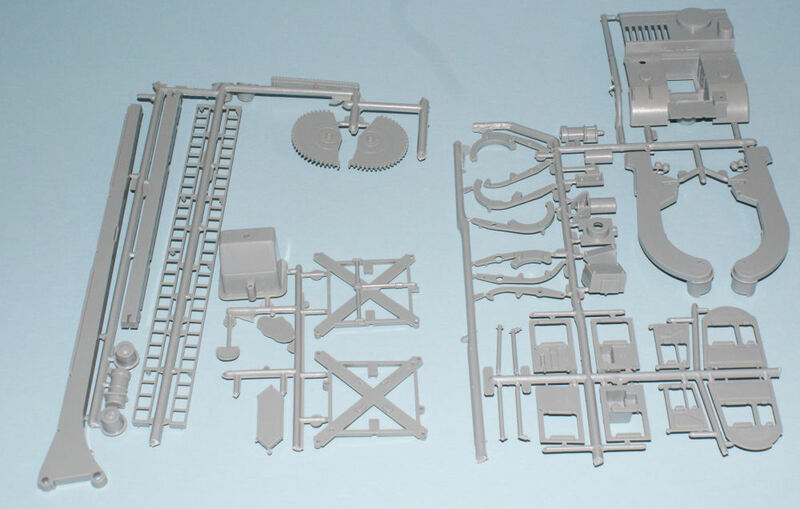 You can see the variety of small sprue trees in the images to the right. The kit was designed to 'box scale' which was the old school philosophy of pattern design - make the kit fit inside of a standard retail box. 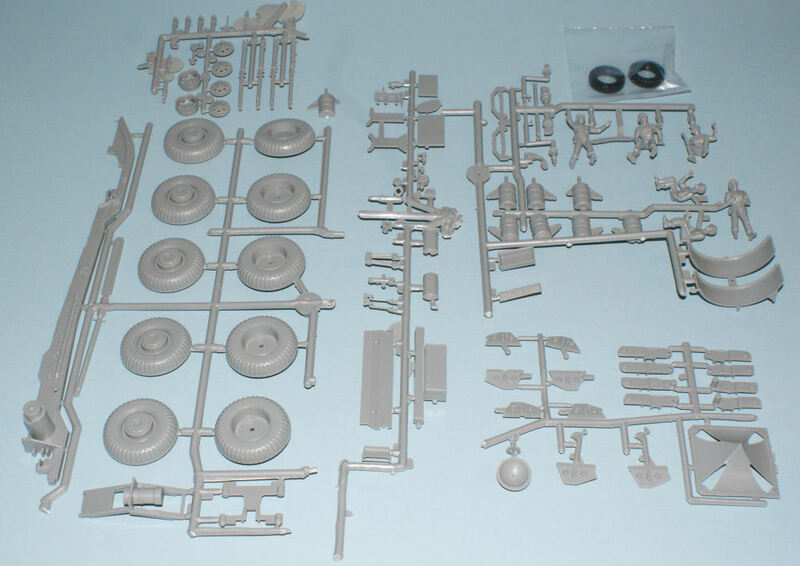 For this subject, the kit scaled out to 1/40th scale, so it is somewhere in-between your 1/35 scale and 1/48 scale collections. Construction is straightforward, though this is one of those kits from Revell that is a fun project with all of the 'working' features. With a little care and good painting, you will have an attractive conversation piece on your shelf or desk. 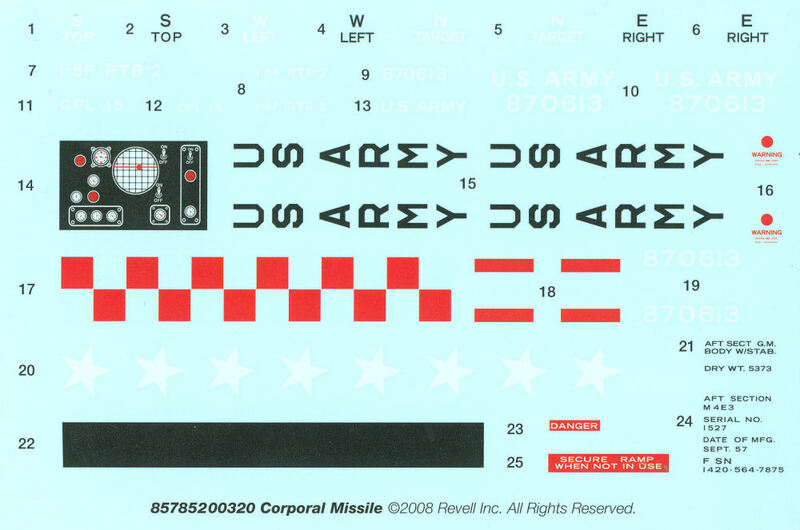 The kit provides a nice set of stencils and markings for the missile and transporter vehicle as well as a display panel for the radar set. I am pleased to see this kit back on store shelves, but take note, this is one of Revell's SSP (Selected Subject Program) kits, so what you see is all you get for another unknown number of years. You might want to grab a few, one to build, a few to sell or trade in a few years when these become rare once again.